HAMMACHER SCHLEMMER Selling 1960's Batmobile! Thats right, for all of you Dark Knights without the millionaire funding, you can now get a Batmobile for special crime fighting tasks. It takes a mere $200,000 for a new custom Batmobile. 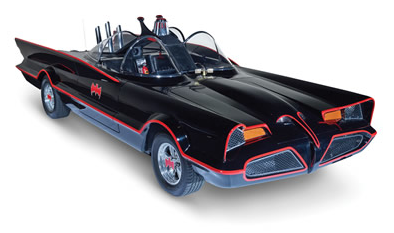 See the HAMMACHER SCHLEMMER Batmobile here. Seems that major media outlets may finally be seeing beyond the Apple distortion field, and calling IOS 7 out of the cloudy mist. I stated in an earlier post how dreadful IOS 7 was on appearance alone. Now USA Today notes the problems stacking up since it's release on September 18th of this year. Draining batteries, dropping Wi-Fi and spotty Bluetooth connections are getting big boos across discussion boards at Apple's own support communities. Some apps are working poorly or slowly, the interface is harder to use for some people, and game players have also found faults. Will Apple fix the pastel color from the 60's flashback, ala technicolor dreamcoat, that has washed through the corporation full of hippies? We can only join hands, sing, and hope so. Seems that with each episode that Paramount creates, they get further from the original artistry and direction that Star Trek storied by Gene Roddenberry. If you yearn for the great stories, strong characters, and focus n acting instead of gratuitous special effects that seem out of place, then here are 2 fan sites that have shown the Classic Trek is still worth watching. Star Trek Continues, and Start Trek Phase 2, The New Voyages, are fantastic examples of what Paramount should consider, bringing back Classic Trek in a revival unparalleled in modern Cinematography. Check out each site for full length episodes, vignettes that are sure to please, and desktops and information for all fans. Ben Carson, brilliant speaker, and doctor, speaks out about the truth of a government controlled health care system.